Hello, Kirsten here. Hope everyone had a lovely weekend. Mine was hectic, Lisa’s too. We’re busy working on projects, none of which we can show you at the moment. As a result, I had no clue what I could put on the blog, until I decided that I would show you some tags that I make when I want to try out ideas. These tags were inspired by THIS post on the Cakewrecks blog yesterday. If you’re unaware of Cakewrecks, then you really should pay the site a visit. They post photos of professional cakes that have gone "horribly, hilariously wrong" & every Sunday they post they post their Sunday Sweets, which showcases the most beautiful cakes you’ve ever seen. This first tag is Weathered Wood distress ink on manila cardstock. I put on a few layers, drying each layer, flicking water on top, letting it sit for a few seconds, then blotting & drying. The stamp is Kanban, stamped with black Archival & coloured with a black Pitt pen & a white Sakura pen. Here’s the same technique, but on a white, linen textured tag. The two tags together. You can see the difference in the background colour. Weathered Wood looks more grey on the white tag. On this one I stamped the Kanban butterflies with Versamark, heat set with white embossing powder – use WOW! powders, they’re excellent – and then Weathered Wood DI on top. For this fourth tag, I used paint on a white, linen textured tag. I mixed black & white acrylic paints & applied them first with a dry brush. It was quite dark, so I added more white paint & continued building up layers, drying each time. I then added water to the paint mix & painted a few more layers, knocking back with a baby wipe & drying, until I decided I was happy with the appearance. The stamps are all Artemio. I stamped the butterfly onto scrap card, embossed it with clear EP, covered it with Weathered Wood DI, added highlights with a white pen & cut it out. There you have it, quick & simple today. Grey is a colour I don't tend to use, but I like how these turned out. I shall have to get myself a proper grey inkpad. Before I finish, a quick reminder about the blog CHALLENGE & the SALE. Both end on the 28th, so you have a few days left. I will be back during the week, but can’t say when at the moment. So, until next time, happy crafting. Well its nearly afternoon now but I have been busy this morning! Now I know I don't blog that much lately due to the fact that I don't get a lot of free time but have found myself with a half an hour free time and thought that I would spend it with you all and show you a couple of photos from the NEC Trade show on Saturday where I was demonstrating for Crafts Too. I also wanted to show you another altered art piece that I did for them that I forgot to send to Kirsten to put on the blog, this box will be coming in soon and are flat packed so that you can decorate all of it easily before you assemble it. Kirsten featured the bird cage the other day on the blog which I have pictured again below. 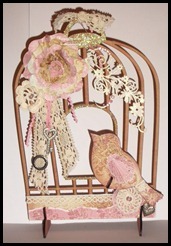 This is also a piece that I made for Crafts Too but the bird cage is available from my lovely friend Anna- Marie from : http://www.annamariedesigns.com/ they are a lovely new line of hers and are gorgeous! All that is left to say that on Sunday I found masses of great new crafting goodies and have some great workshops planned for this year and will be updating the blog and website soon with them. Well have a lovely rest of the day and I hope to be back soon with more exciting news!!! A good Tuesday morning to one & all. Kirsten here, with the final four samples that Lisa made for the Crafts Too stand at the Craft, Hobby & Stitch International trade fair at the NEC, in Birmingham. Many of the UK craft companies will have launched their new product ranges in the last few days & I’m sure Lisa will have returned home last night with information about lots of new things that we absolutely must have in our crafting stash. I’m hoping she might allow me a sneak peek or two………… But enough of that, on to today’s projects & Lisa has used the same colour palette on four different pieces. I like this card very much. I’m always looking for differently-shaped card blanks & the curve on this one is lovely. See the floral flourish on the top left? Isn’t it pretty? At first I thought it was a rub-on, then I examined it in close-up & I’m fairly sure it's embossed. Either way, I want it. I love tags, they’re one of my favourite things to make. they’re perfect for trying out new techniques – if it doesn’t work, at least you haven’t wasted a piece of your favourite card stock. And if it does work, you’ve got the basis for a new project & you can use it as a topper – choose your card blank, add some complementary paper, stick the tag on top & voila! A lovely card for someone. 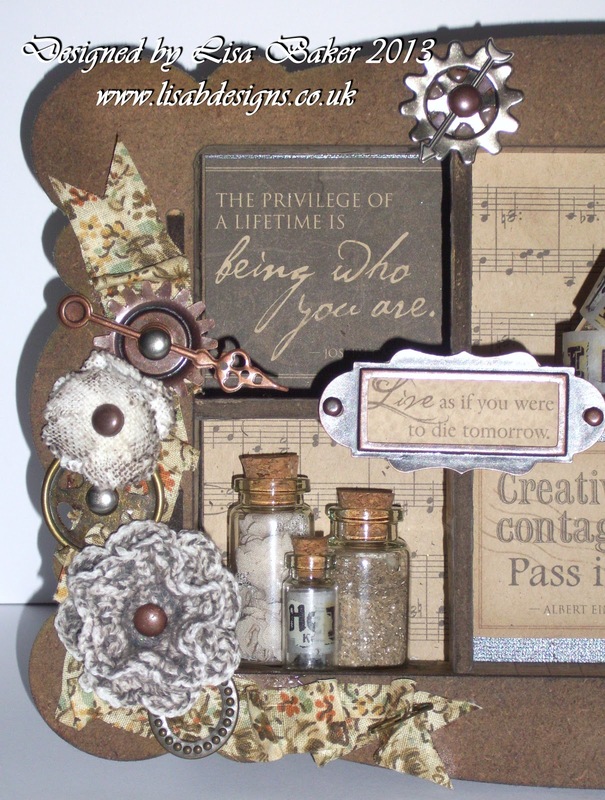 This gorgeous wall plaque would fit in perfectly with the current challenge theme. And you need to see it close up, so don’t forget to click on the image. The heart is a die cut – so pretty. Finally, this beautiful box, with a close-up of the lid below – which has a very interesting die cut on it, underneath the flowers. The black core’dinations paper goes so well with these patterned papers. So, there you are. Three posts full of gorgeousness. If, by any chance, you missed the first two, you will find them HERE & HERE. Once I have more product information, I will update you here & on Facebook & Twitter. Before I finish, a quick reminder about the SALE. It ends on February 28 & each time I check, there are fewer items left, so if you see something you want, buy it straightaway, Lisa will not getting any more. That’s it for now, thank you for visiting, I hope to be back soon. Until next time, happy crafting. Good morning, Kirsten here, hope everyone had a nice weekend. I’d like to show you two more of Lisa’s Crafts Too samples today. She sent me a text message last night to say she’d had a lovely day & reminding me that she’s not demonstrating today, so apologies for that error. Her plans today are focussed on shopping for new crafting goodies for us & I certainly can’t complain about that. If you saw yesterday’s POST, you’ll remember that I thought there was tissue tape on those cards. And, having had time to examine the photos thoroughly, I can see I was right. It’s very clear on this card, where Lisa has used it to make a patterned background paper, layering it over pieces of white & black card stock. I hope this is one of the new goodies she chooses for us to buy, I must have it to add to my tissue tape collection. I also very much like these flourishes, they could definitely find a place in my stash. This is a real beauty. I hope you can see all the details. The resist & the embossing looks terrific & I love all the metal embellishments. That’s all I have to show you today, but there are more gorgeous samples & I will post them tomorrow. Hope you’re liking what you’ve seen so far, let us know what you think in the comments. Good morning! I hope you’re enjoying your weekend so far. I’m delighted to be able to show you the first of the samples Lisa made for display on the Crafts Too stand at the Craft, Hobby & Stitch international trade show, happening in Birmingham between now & Tuesday. 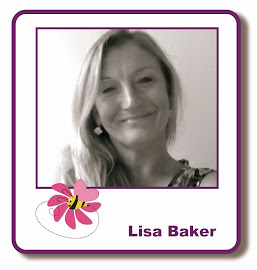 Many of the items used for these projects will be released for sale today & some those of you who attended Lisa’s classes in Maidstone will recognise. 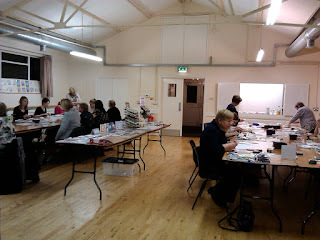 No doubt, Lisa will have many of the new releases for sale at her April class & on the website very soon. I’m very much interested in what seems to be tissue tape on the cards above, (the strip across the centre, with the musical notation). This birdcage is beautiful. When I first saw it, I thought it was a card, but I think it is actually a chipboard piece on a stand. I will get more information from Lisa next week, when she returns home. Close-ups of the birdcage. I love the embellishments – lots of pretty lace & flowers. Thanks for visiting the blog today. I’ll post more photos tomorrow. Until then, happy crafting. Good morning, blog followers & visitors, Kirsten here. I’m afraid I have nothing new to show you, Lisa & I have been so busy that we haven’t managed to meet up since the Maidstone class two weeks ago. This weekend, she is demonstrating for Crafts Too at the Stitches trade show in Birmingham. It’s her first time as a Crafts Too demonstrator, so I’d like to wish her well. She really doesn’t need any good luck wishes, because she will be fabulous, as she always is. These are a few cards I made a while ago when I was playing with the Hobby House images & flowers. I really liked the colour combination of aubergine & soft peach, with a little bit of pink thrown in. The backing papers are mostly core'dinations & I put them through embossing folders. I don’t think there’s any other news at the moment. The blog challenge is continuing on the CHALLENGE PAGE for another twelve days, so you have plenty of time to join in. Likewise, the SALE on the website doesn’t end until February 28, so you still have time to grab a bargain or three…. I hope to be back soon, so in the meantime, have a lovely weekend & happy crafting. Hello blog visitors, hope you had a nice weekend. This is a very quick post to show you Lisa's final two card samples for her classes in Maidstone on February 1. That's all from me for tonight, I've got conjunctivitis at the moment, so can't see the computer screen very well. I'll be back soon. Until then, happy crafting. PS Lisa has extended the SALE until February 28 & there's still lots of time to enter the challenge. Evening, crafters, Kirsten here, how's your Thursday been? Mine has been busy & cold. I am definitely ready for some warmer temperatures. 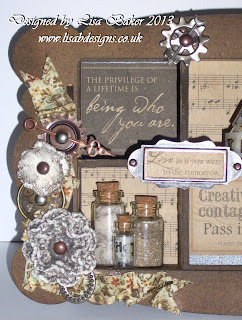 A quick post tonight to show you two more of Lisa's card samples for last Friday class. She used these stamps & beautiful patterned papers from Lavinia Stamps. Many of these sold out at the class, but there were some left over. Lisa hasn't had time to put them on the website yet, but if you email her at enquiries@lisabdesigns.co.uk I'm sure she'll be able to help you. The patterned papers make terrific backgrounds & show off the resist embossing & shadow stamping perfectly. They make very dramatic & beautiful cards, but they're not over the top. That's it for tonight, thanks for looking. We've had three more entries in the February challenge today, see them HERE. Hello! Happy Tuesday to one & all. 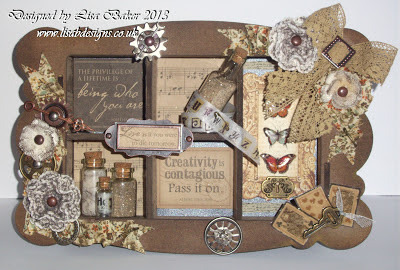 I want to show you the beautiful sample cards Lisa made for last Friday's class. There's quite a few, so I thought I'd spread them out over a few posts. After waiting for months, Lisa finally has WOW embossing powders in stock, in both the large, 160ml size & the regular, 15ml size. If you've ever used these EPs, you know how good they are. I've got the clear & the clear sparkle & they are excellent. I got the large jar of the white from Lisa & when I put it next to my original EP, I couldn't believe the difference. My 'white' EP was cream, compared to the brilliant white of the WOW powder. I'm going to get the black twinkle one next, it looks great. By the way, if you work out the price, the 160ml pot is better value than the 15ml & will last for ages. Lisa used the EPs on these cards with the resist & shadow stamping the techniques she taught at the class. She used the Bright White EP on the card above & the Ebony on the one below. I love these colours. Don't think I've ever used black & yellow together, must give it a try. This card was definitely a talking point at the class. When you walked towards it, it looked as if the white flowers were decoupaged against the pink ones - a real optical illusion. The patterned papers are either a WOW stamp, or the WOW resist paper, but I think they all sold out at the classes. I'll let you know if Lisa gets them back in, or you can email her at enquiries@lisabdesigns.co.uk if you're interested in them. The coloured inks are a combination of Distress & Adirondacks. That's all for tonight, thanks for visiting. We've had the first two entries into February's blog challenge. To see them & get the details on how to join in, go HERE. And the January sale is now the February sale, so check it out. Congratulations, Georgina! Please contact Lisa at enquiries@lisabdesigns.co.uk & she will give you your voucher code. And feel free to copy & paste the winners' picture from the blog homepage to put on your blog. That's it for now, the new challenge is on the challenge page, we're looking forward to lots of entries this month. Have a great Sunday. PS If any of you who were at Friday's classes make anything with the items you bought, why not let us know? We'd love to see your creations. You can post photos on our Facebook page, send us a link to your blog, or if you don't have a blog, email them to me (isisimaginings@gmail.com) and I'll post them here with your name. Greetings, lovely blog visitors, Kirsten here. I hope you are enjoying your weekend so far. Tonight's post is all about Lisa's class in Maidstone yesterday. Due to the first Friday of January falling so close to the New Year, there was no class then, so yesterday was the first time we'd all met since the Christmas party class in December. It was lovely to see so many familiar faces & to welcome some new ones. As she always does, Lisa had new crafting goodies to tempt us with & below are the very pretty patterned papers from Lavinia Stamps. These are some of the new Lavinia stamps that were for sale yesterday. After using them on their card projects, many of the ladies found these stamps "accidentally" falling into their baskets! Last year, when Lisa had asked for class suggestions, one that received many requests was the resist technique, so she chose to make that the first class of 2013 & combined it with shadow stamping. white embossing powder, then stamping with a combination of Distress & Adirondack inks. As someone who is rubbish at creating a scene like this, I was fascinated watching her demonstrate how she builds up the picture, using a few stamps & some ink. I also loved watching each of the ladies create their own images. No two were the same, but they were all lovely & everyone seemed happy with their projects. It was a class that ended with a great many inky fingers, in shades of blue, purple & green. 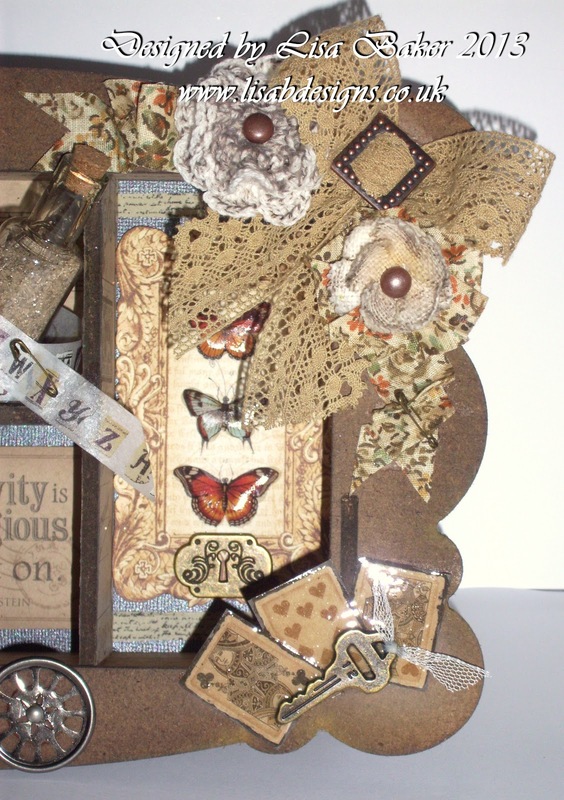 Unfortunately, due to previous commitments, there won't be a March class, so Lisa's next class will be on April 5th & the project will be an altered box. I'm not sure if there are any places left, but if you would like to join us, please email Lisa at enquiries@lisabdesigns.co.uk She keeps a reserve list, so your name can be added to that, in case of a cancellation. I posted the new challenge yesterday. The theme is 'LOVE'. And no, you don't have to make a Valentine's project. :) All the details are HERE. 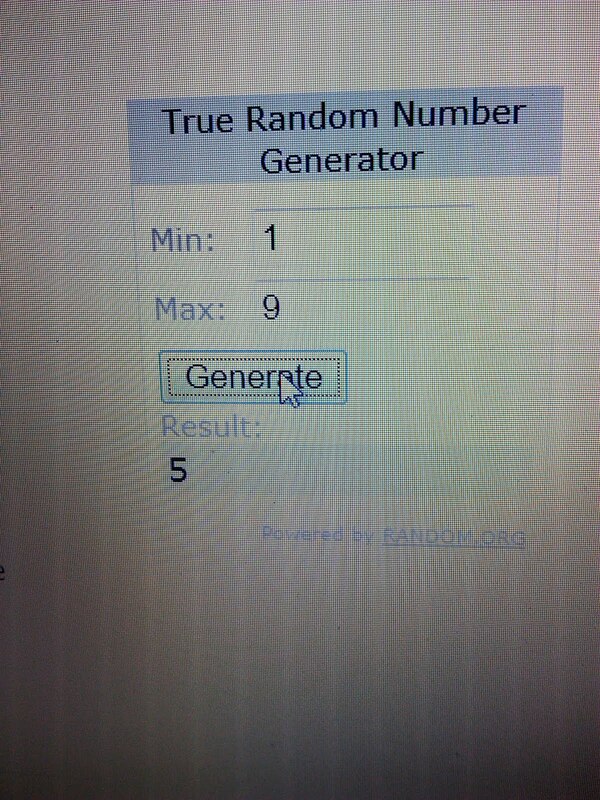 I'll post the winner of the January challenge tomorrow. I forgot to ask Lisa when the SALE is ending & it's still on the website, so take a few minutes to see what is still available. I think that's all for now. Thank you for continuing to visit the blog. Until next time, happy crafting. Morning all, Kirsten here, happy Friday. Just a quick post to let you know the February challenge is now on the challenge page. Looking forward to seeing your entries. I'll be back over the weekend with a proper post; today is Lisa's first class of 2013 in Maidstone, so I'll have a report on that. Good morning, Kirsten here, happy March 1st. I’ve actually written this post on Thursday night & scheduled it to appear this morning, because I knew I wouldn’t have time to write it on Friday. The new challenge is up on the challenge page & I made a card to illustrate it. If you’re thinking that it looks like it was thrown together, you’re right. I made it in about fifteen minutes on Thursday night, because I couldn't come up with any other ideas. And of course, it was dark, so the photos are rubbish. Very simply, it’s Spiced Marmalade & Scattered Straw distress inks on white cardstock, with water flicked on top & dried. I stamped the Kanban collage stamp & the corner flourish stamp with coffee Archival ink & added the Craftwork Cards sentiment. The butterflies were coloured with the same DIs, used as paint. To finish I spritzed everything with a mix of a pale gold mica powder & water. You might be able to see the slight shimmer in the bottom pic. Ok, I have to go. Thanks to everyone for the gorgeous entries into the February challenge. 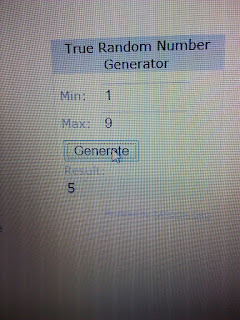 I’ll use random.org to draw the winner, then post the result over the weekend. Have a lovely Friday.